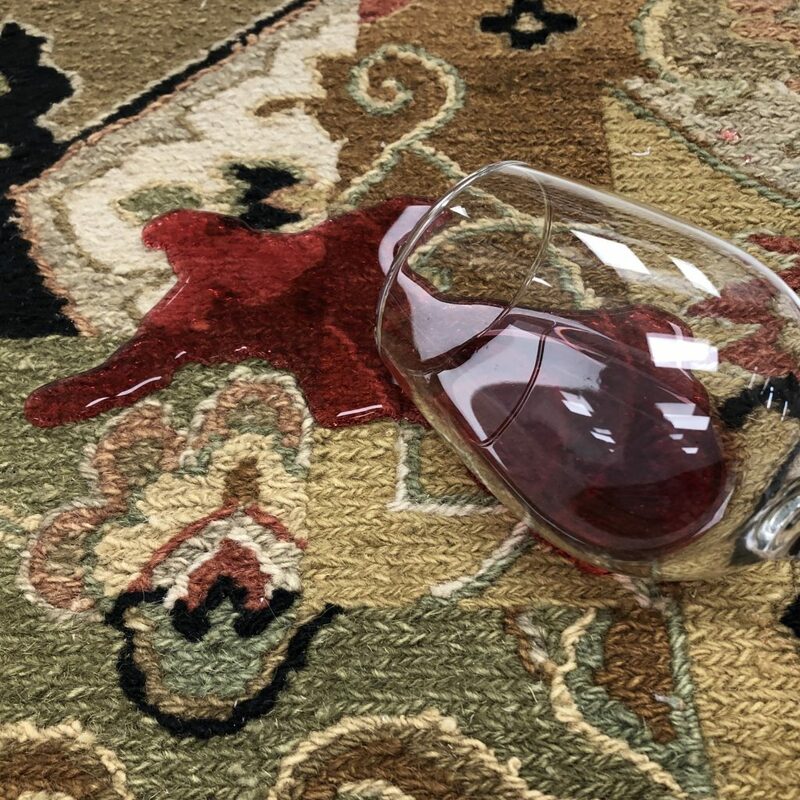 The time will come when something is spilled on your rug – coffee, soda, wine, or a pet stain. There is a tendency to grab a cleaning product and scrub the area. This inevitably causes more permanent harm than good. A good emergency system is a very simple one, and all you need is club soda (or soda water) and cotton towels. Immediately blot the wet area with a white cotton towel. Do not scrub the affected area, as this untwists and breaks down the wool, silk, or cotton face fibers. Look at the wet towel for two things: is the liquid spill absorbing into the towel; and also, are any of the rug’s dyes absorbing into the towel. If the rug’s dyes are absorbing into the towel, blot a bit more and then STOP. No more work can be done to this area without causing the area’s dyes to bleed together. This type of damage can devalue your rug. You want to stop before you make it worse. Consult a professional rug cleaner. If the rug’s dyes are not absorbing into the towel (you only see the spill absorbing into it), then place a folded towel underneath the affected area and pour a small amount of water onto the area (or use a saturated sponge to apply the water). Take another towel, blot the top side, and then place a folded towel on top (creating a “sandwich” – folded towel, rug, folded towel). Stand on the area for a few minutes (or use a heavy book), and this will help the moisture to absorb from both sides, hopefully displacing the spill. When you believe the absorption to be complete, elevate the treated area so that airflow can reach the back of the rug (prop it up) to dry the foundation thoroughly. Do this for at least one day to ensure complete drying. The rug may feel dry to the touch, however, the cotton foundation may still have moisture within it. Without air drying the moisture could eventually lead to mildew and/or dry rot. Give the rug adequate time to dry. To contact us, use the “Contact Us” Tab and scroll down to “Drop Us a Note”; or call: 770-753-4242. We look forward to hearing from you so we can discuss our cleaning process and the professional care of your antique, oriental or area rugs. Please read our “Post” – “Coffee or Dark Colored Drink Spills“.